We spend most of our summer between 95 - 105. This week we hit over 90 and my winter/spring lettuce is now bitter. However, it was out in the full sun and not shaded by any other plants. I have a front patio that is on the north side of the house. I have window boxes I usually plant flowers in but am thinking of using them for growing lettuce. I'm going to be installing a mister system to keep us cooler out there since we're a dryer heat. 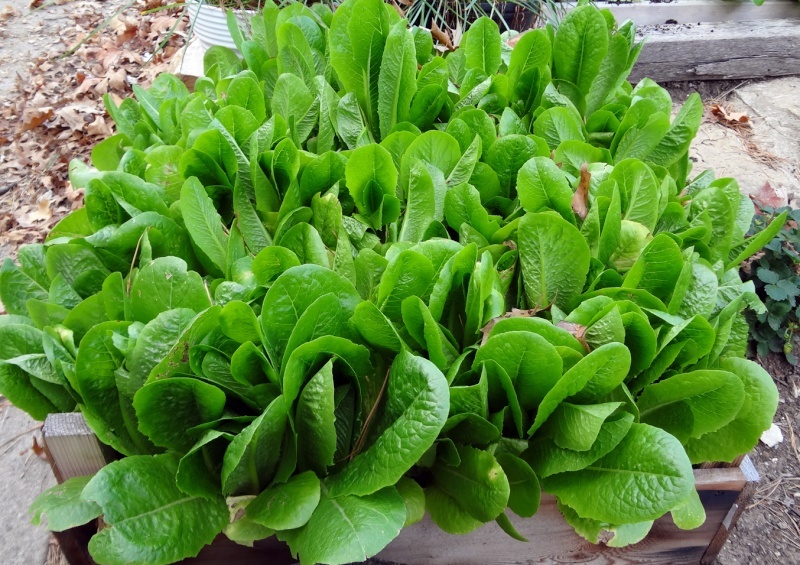 Can I plant any of my usual lettuces and simply harvest them as baby lettuce? Will they grow okay for a while? My thought was to grow them in the shade, in a more dense planting and simply pick individual leaves. Will I get enough time out of them before they bolt so that I can keep harvesting for salads or is it likely a waste of time? Any particular lettuce you can recommend for heat tolerance from personal experience? I would most certainly try it! That's how micro and baby greens are harvested so I don't see why it wouldn't work! Hi Audrey, This is Sigrid in Fresno. So that's why my lettuces are now bitter! The only lettuce that is not bitter in the sf boxes is in an area mostly shaded by the orange tree. I'm going to plant some more but in a large pot in an area that will only get morning sun. Two tomatoes in separate pots have rolled leaves and I'm wondering if the soil is just too hot. I slipped one pot in a white Gro Bag and then set the ensemble back in the water tray. 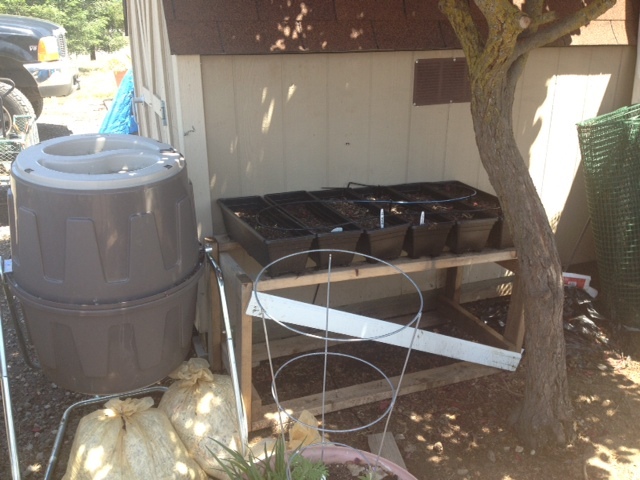 I will test both pots tomorrow with a probe thermometer to see if the white bag helps lower the soil temp in the pot. Boy, Sigrid, I could do without our hot summers! Especially when they start in April!!! I have been fighting the rolled leaves issue... it seems like maybe a mite problem? I can't see any bugs with the naked eye and don't have a magnifying glass. However, I washed the leaves off twice a day with the sprayer and then Neem oiled them and most of my tomatoes have recovered. One is still struggling. Here's my solution for the existing lettuce I planted. I pulled all of the Black Seeded Simpson lettuce as it had gone bitter even though it hadn't yet bolted. I also pulled a curly edged lettuce that was kale it was part of the Mescalun mix and I don't know what it is. I had some old window sheers in the closet. I clipped them to the greenhouse frames. I left the sun loving plants uncovered - especially as the sun rises in the sky they'll be entirely unshaded on the north side. The light that is coming through is a very softly filtered light that I think the lettuce will like. I'll have to measure the temperature differences and see how much cooler it is under the cover. Regarding using Neem oil, I will try some on the tomatoes. I have used it before on my roses and gardenias for aphids and a new pest, teeny white flies. It didn't work on the white flies and I ended up pulling up all but one gardenia in the back yard. The leaves were chewed and covered with blackish mold. Even my home-made mold solution that I use on the orange tree with 90% success couldn't help the gardenias. On the positive, I had room to install some sfg boxes for my first adventure into intensive gardening. As a side issue, I am getting a little worried about all the insects that have suddenly appeared on my veggies. If neem oil on the veggies doesn't work, I'm almost to the point of using pyrethrin. But, I don't want to hurt the bees that are attracted to my roses. And I don't want the cat to roll in the contaminated dirt in the main flower beds. I read pros and cons on sevin and pyrethrin, and I think I will I will try some pyrethrin after sundown so I don't directly hit any bees. Any feedback from members is appreciated. My experience with rolled leaves is too much watering in a weird combination with high heat. It hits hardest with tightly pruned tomatoes. Beefsteak has a reputation for leaf rolling as well. 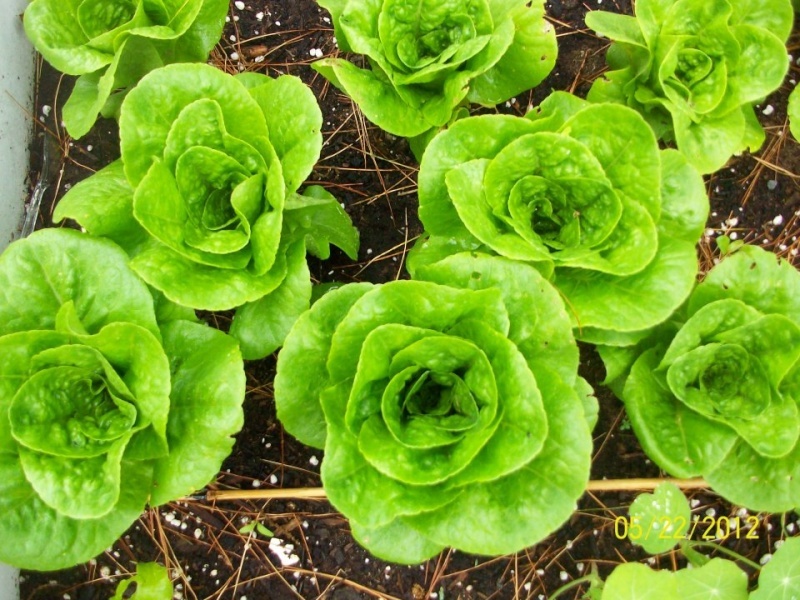 I think the idea of growing summer lettuce on the north side, and planting it thick and replanting often are good ideas to avoid bitterness. Tell us how it goes. @sanderson wrote: Regarding using Neem oil, I will try some on the tomatoes. I have used it before on my roses and gardenias for aphids and a new pest, teeny white flies. It didn't work on the white flies and I ended up pulling up all but one gardenia in the back yard. The leaves were chewed and covered with blackish mold. Even my home-made mold solution that I use on the orange tree with 90% success couldn't help the gardenias. On the positive, I had room to install some sfg boxes for my first adventure into intensive gardening. Hi Sanderson. I am a brand new gardener, so I am hesitant to write. However, I have had great success against those pesky white flies using a combination of neem oil and peppermint liquid soap. The peppermint masks the neem oil smell a little (but only a little). Really though, adding the soap makes for a pretty good natural pesticide. Dear Windmere, Please provide information on using Neem oil and Peppermint liquid soap. The quantities of each ingredient, including water, and container(s) used to mix and / or apply. I am desperate. I have roly polies or sow bugs, piercing/sucking beetles, teeny white flies, gnats, (snail and slugs but I do night patrol which is really helping plus safe Sluggo containers here and there), small yellow iridescent yellow flies, plus the usual aphids. I've used spray bottles for Neem oil. few drops of dish soap and water in the past with mediocre results against aphids. Plus hosing them off., But if I hose them off this year, they will land in my sq ft boxes!! For my orange tree black mold, I use a spray jar attached to the hose. I use 1/4 cup of dish soap, 1/4 cup of cooking oil (grapeseed oil) and 1/4 cup of baking soda. Add water to container, mix thoroughly. Obviously, I spray when it is not blooming! @sanderson wrote: Dear Windmere, Please provide information on using Neem oil and Peppermint liquid soap. The quantities of each ingredient, including water, and container(s) used to mix and / or apply. I am desperate. I have roly polies or sow bugs, piercing/sucking beetles, teeny white flies, gnats, (snail and slugs but I do night patrol which is really helping plus safe Sluggo containers here and there), small yellow iridescent yellow flies, plus the usual aphids. I stir the mixture well (in my measuring cup). Next I pour into spray bottle. I spray a generous mist on all my plants. The recipe in the article makes 2 quarts, but that is way more than I need. Plus, neem oil is pretty perishable so I make a small batch. I store my spray bottle in the fridge. After first spray, I apply the mist every third day (or so) as a preventative measure. I am sure the neem loses its potency by the third day, but I can still smell the nasty stuff... so I hope I get some benefit from it. In any case, the peppermint soap is probably still helpful. As I said, this works for me. There are probably better natural pesticides out there. I have not tried this method yet, but I figure I'd give it a shot. At the very least, it will provide some extra beauty around my beds. Dear Windmere, Thank you for your Neem Oil & Peppermint Soap recipe. 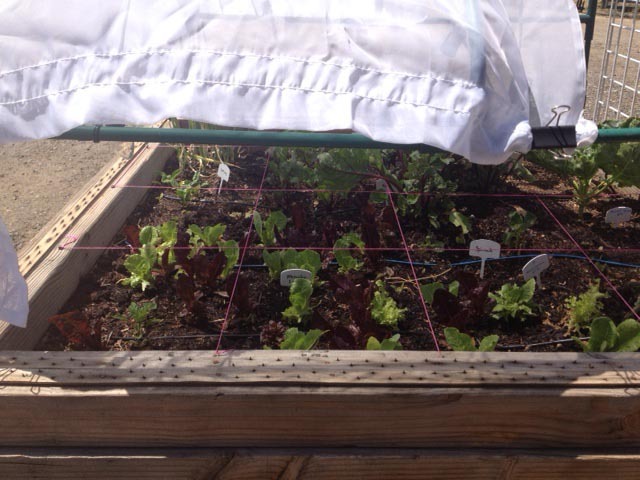 I did a 2x2 box (12" deep) with lettuce last year...I planted an entire packet of baby romaine seed in the four square feet (very dense) and it was located in an area that received shade from the intesne western/ setting sun...had decent luck with no bolting...and the smaller protected leaves were a bit sweeter. I may try some in 100% shade this year as an experiment. @landarch wrote: I did a 2x2 box (12" deep) with lettuce last year...I planted an entire packet of baby romaine seed in the four square feet (very dense) and it was located in an area that received shade from the intesne western/ setting sun...had decent luck with no bolting...and the smaller protected leaves were a bit sweeter. I may try some in 100% shade this year as an experiment. I think this pic was from Aug/ Sept...a short period of time where both lettuce and tomatoes come fresh from the garden straight into a BLT. I currently have spring beets in that box...trying lettuce in another spot this spring...both transplants started indoors and dirct seed. Planting this dense never really let heads form...but I don't know if it's the plant spacing or if baby romaine really doesn't form any type of head. I saw a gardening show where the person's whole back yard was mostly shade and they grew all their cool weather crops in the shade. It was beautiful! @landarch wrote: I don't know if it's the plant spacing or if baby romaine really doesn't form any type of head. Mine are babies and they formed heads in the end. 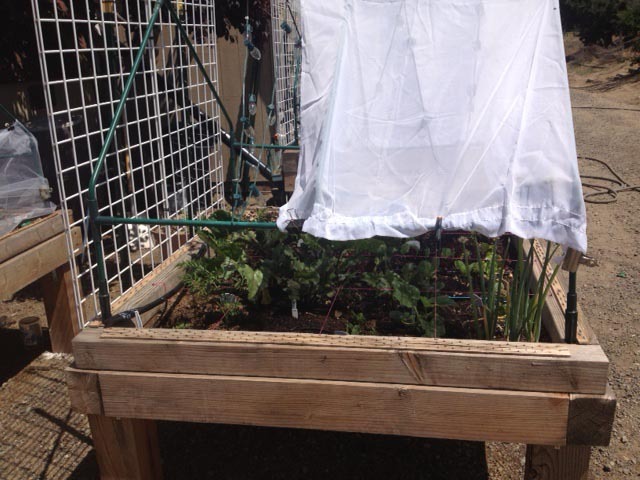 @Triciasgarden wrote: I saw a gardening show where the person's whole back yard was mostly shade and they grew all their cool weather crops in the shade. It was beautiful! folks, for the great ideas! I happened upon a lucky find last week. A friend was throwing away some sort of wood frame he had built for some odd use, my hubby spotted it and knew I could give it a purpose. It just happened to be the perfect size to make a raised bed stand to put my 2 foot window garden boxes on to make a lettuce growing station. I put it in my main garden, under a plum that provides heavy shade as well as the two garden sheds to the north and east. We tapped into the water system there and it's the coolest place on our property and should work well. My photos aren't uploading from my IPhone right now, something's screwy. I'll try to get a picture uploaded later. I thought I would give a report about what I'm experiencing in my lettuce growing attempts. We have had two weeks of temps over 100 degrees, currently this week has gotten to 106, yet so far I have experienced no bolting and no bitterness in my new lettuce plantings. The old lettuce that was planted in December, bolted a couple of weeks ago, but I would expect that as its life-cycle was complete. All of my lettuce is either planted in deep shade, on the north side of the house or under heavy, vining plants that are shading them well. I'm picking all lettuce as micro greens. Every time I pick the lettuce, I am only leaving 2-3 leaves at most. My theory is that I'm constantly forcing the lettuce to grow and it's not allowing it to get bitter or to bolt. One of the best lettuce varieties that I'm growing seems to be Oak Leaf. It's handling the heat well and growing profusely. Red Romaine is doing well as is Romaine. I should have planting even more thickly than I did. The shade grown lettuce is leggy and fairly slow growing. But at least it's growing! I planted spinach but none of it has germinated. I'm taking care of a friend's garden (a mile away) while they're on vacation and all of his lettuce is suddenly bolting after 2 days of the heat. I'm harvesting enough lettuce for 2 large dinner sized salads every day or two out of perhaps 10-12 square feet. I think I will go harvest some lettuce a bit harder. That idea of picking all but a couple leaves to stimulate new growth is interesting and makes lots of sense. It is sort of what one does when one mows a field to stimulate a new flush of growth.